Each week, Voice of Russia hosts Red Line, a discussion about the events of the week, as seen from Moscow. This week, events in Egypt, concerns over cyberwarfare and the former president of Pakistan take center stage. Ekaterina Kudashkina: This week we start with the stormy events at the Middle East, where the ousting of President Hosni Mubarak in Egypt after weeks of protests sent shockwaves through the region, then we turn discuss the increasing threat of cyberattacks, and finally, we return to the subject of ousted dictators to discuss former Pakistani President Pervez Musharraf, who is currently living in exile in London and is wanted by Pakistani authorities. First, we go Beyond the Headlines and focus on the Middle East. Exactly one week after the resignation of Egyptian leader Hosni Mubarak, nearly the entire Arab world exploded with mass rallies of support and demands for political freedoms and a better quality of life, rocking regimes in Algeria, Jordan, Yemen and Bahrain. Iran also witnessed street protests not seen since the aftermath of presidential election of June 2009. Sergei Strokan: The main question is where this will lead the Middle East and whether democracy will really triumph. It is the textbook example of a revolutionary situation as described by Lenin – those at the bottom don’t want the old life, those at the top don’t know how to control them. But, of course, this is the 21st century and the Internet and other factors do play a role. The last call received by Mubarak, hours before his resignation, was from President Barack Obama. The call from the White house came at a critical moment; Mubarak had announced in a public speech that he would not quit, against all expectations. The story is reported this way: In a call, described by his aides as “one of the most difficult conversations Obama has had with a foreign head of state,” the U.S. president bluntly told Mubarak "there needed to be a change in leadership in Egypt," and it needed to come within days. Ironically, it was not only the White House that hailed “the democratic transition in Egypt.” Iranian President Mahmoud Ahmadinejad claimed that the Egyptian revolution was inspired by Iran's 1979 Islamic Revolution. Sergei Strokan: I think the recent role of the White House in Egyptian events reveals a growing confusion in the U.S. policy towards the Middle East. The ongoing carnival of revolutions took Obama’s team by surprise, and the administration has found itself at a crossroads, desperately trying to achieve two conflicting goals. However, the second approach is based on the notion that it is time to revamp this thinking, and that today, regional democratic aspirations today should come first, and once the dictators are toppled, the world will inevitably witness the emergence of a new Middle East. Ekaterina Kudashkina: Advocates of this theory seem to believe that after a cleansing of the old political space, democracy in itself will be a guarantee of a secular, moderate way forward. Mira Salganik: This was the idea behind the Middle East concept voiced by the administration of George W. Bush. What we are witnessing today is some sort of rebranding of the idea with a more gentle technique. Ekaterina Kudashkina: But by trying to happily marry the “democratic” and the “moderate” in the Middle East, the U.S. might one day face another major disappointment, discovering that there is neither democracy, nor loyalty. Sergei Strokan: There still is a big question mark over the sincerity of the democratic agenda of the Egypt’s new military rulers. The interim Egyptian leader, 76-year-old Field Marshal Mohammed Hussein Tantawi, is described by a leaked U.S. diplomatic cable as deeply resistant to change, intolerant of intellectual freedom and singularly focused on the stability of the regime. This might be a serious problem. Ekaterina Kudashkina: In fact, some analysts point out that the Egyptian army promised democratic change as early as in 1952 – and we all see the state of affairs six decades later. Mira Salganik: Broadly speaking, the military in third world nations have many times stepped in during the transition to democracy – from Indonesia and the Philippines to Pakistan. But history shows that armies and democracy are always uneasy bedfellows. Ekaterina Kudashkina: Let’s listen to our expert - Dr. Alon Ben-Meir, professor of International Relations and Middle East Studies at the New School and New York University. How did the current state of relations between Egypt and the U.S. develop? During the uprising in Egypt, the Obama administration wanted Mubarak to stay at least until his term ended in September. But in the end, the public was totally and completely committed to ousting Mubarak. All this represents a major problem for the U.S. throughout the Middle East, because Arab countries—the majority of which are authoritarian—see that they can expect the U.S. to support them until the public becomes enraged, then the U.S. will shift its support from the government to the people. Now, the Obama administration needs to determine what sort of strategy they need to pursue in order to achieve two main objectives: stability and peace on one hand and reform on the other. Theoretically, stability and peace go hand-in-hand with reforms, but this is not that natural for the Arab world, given the characteristics of the Arab regimes. Ekaterina Kudashkina: This all started when protestors were insisting on some purely social and political issues. It was understandable that President Obama chose to support the democratic movement. In Bahrain, we are now witnessing the first indications that this is a sectarian battle, which is a completely different affair. What stand is the current administration going to take? Alon Ben-Meir: The fault line lies in the fact that pushing for political and democratic reforms is fine, but when you do so in a country like Egypt, if these reforms are not concurrently supported by economic and social reforms, no political and democratic reforms can be sustained. 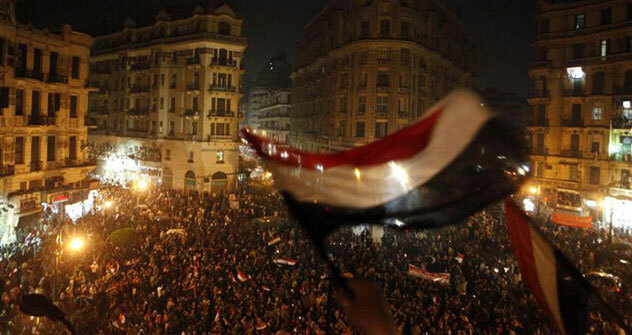 Today in Egypt, they have succeeded in overthrowing Mubarak, but they keep demonstrating. What they want now is better wages, jobs, health care and better education. When the U.S. pushes for political reforms without paying much attention to the fact that it must also concurrently push for economic development, these political reforms, even if they took place, will eventually backfire. You cannot have freedom when you are hungry. More than 50 million people in Egypt live below the poverty line. Giving political reforms and freedom to them does not put food in their mouths, does not provide jobs or any other thing they need like clothing, better education and better healthcare. So, to suggest that you can push for political reforms without sustainable economic development, it just won’t work. As for the people of Bahrain, they are now demonstrating for freedom, they want to be free. But the majority of the population is part of the Shia community, and going back decades there has been discrimination against this community. The king, the government apparatus and most of the military are Sunnis. But they are the minority. So, you cannot compare actually the two. Each Arab country has different issues, different kinds of problems. What they share in authoritarian regimes. But no solution for one country is fully applicable to another country. The U.S. has a tendency to generalize, saying that the Arab world is a single unit, but that is not going to work. We have to be very careful when we try to address what’s going on in Bahrain, Yemen, Egypt and other places. They no longer want to blame the West for their problems, grievances and despair. They are pointing fingers at their own government and this is a very critical difference that has to be noted. This wave of instability is going to sweep the region, one country after another and many countries sometimes simultaneously. But there is no one medicine that can be applicable to all countries. We have to look at each of them separately and deal with them separately. For example, in the case of Egypt and Bahrain, Egypt is considerably far poorer than Bahrain will ever be. So, what you need is a far greater emphasis on sustainable economic development. Ekaterina Kudashkina: And now welcome to our second heading –Between the Lines, and welcome to more news of the Internet warfare. A group of hackers who call themselves Anonymous decided to support the political uprisings in Tunisia and Egypt. To do that, they temporarily disabled access to 10 Tunisian and four Egyptian government websites. They explained that they did so to retaliate for Internet censorship in both countries. Mira Salganik: It really seems we’re entering an era of Internet warfare. Ekaterina Kudashkina: Let’s ask our expert - Professor of National Security Studies at the US Naval War College Nikolas Gvosdev. Are we entering a new age - the age of cyberthreats? Nikolas Gvosdev: We are certainly entering a new age where, first and foremost, control over information is no longer in the hands of governments. It is very difficult for them to prevent information from leaking out and spreading around the world, whether it is sending pictures on social networking sites, or large amounts of government documents that can be easily captured on a flash drive and sent out. Another area of importance in terms of cybersecurity is computer systems that are accessible from the Internet as part of the global network. The more we entrust computers with day-to-day functions of our society, the more these systems are subject to attack and disruption. So, we have two combined issues to work on - the uncontrollable spread of information that can threat governments and regimes, and the growing networks in the computerization of day-to-day life, which makes it far easier for someone to disrupt everyday life in another country. Ekaterina Kudashkina: Is it right that at this year’s Munich Security Conference, issues of cyber security were placed on the agenda for the first time ever? Nikolas Gvozdev: Yet, it is recognition after many years of concern over cybersecurity matters. As we have seen with WikiLeaks, it is possible for someone to take huge amounts of documents. It would have taken you weeks to deal with the same amount in the paper form back in old days. Now, you can copy them to a flash drive and disseminate them. Ekaterina Kudashkina: We are entering an age of new warfare, in which a potential enemy can be neutralized without casualties, right? Nikolas Gvosdev: Yes, this is what we are looking at - the possibility to inflict damage on a country. It depends on how computerized the country is. The more technologically primitive it is, the less likely these things are effective. The more the country depends upon its computer network to run its day-to-day business, the more vulnerably it becomes. In future, cyberweapons will be deployed alongside traditional weapons and we’ll have both traditional campaigns and cybercampaigns to disrupt an enemy’s command and control networks. Ekaterina Kudashkina: Is there any efficient way to defend against those weapons? Nikolas Gvosdev: You can invest more in securing your networks, in improving your firewalls, in implementing policies that limit the ability of people to access the Internet, browsing it for fun or social reasons. Hackers are always coming up with new methods and defenses are always catching up to it. The question will be whether or not particularly governments want to invest in the amount of money it will take to defend against cyberattacks. Some governments will invest in new software capabilities, whereas other governments may chose to invest in bringing hackers to work for the government to try to offset the advantages the other hackers may have. The U.S. now has a cybercommand and a newly established separate branch of the military structure to deal with this and I think this is something that planners will be looking at in the future. Ekaterina Kudashkina: We finally come to our Man in the News segment. Who would have thought that the person suddenly skyrocketing into the world headlines this week would be General Pervez Musharraf, the former President of Pakistan, living in exile in London? Musharraf has found himself in the center of another controversy as a Pakistani court issued an arrest warrant for him over allegations he played a role in the 2007 assassination of Benazir Bhutto, but Pakistan doesn’t have an extradition treaty with the UK. Sergei Strokan: I wonder why those in Islamabad suddenly dug into Musharraf’s story three years after his resignation. I don’t understand their motives – after stepping down in August 2008, he moved to Britain and was keeping low profile - living in a sort of self-exile. The lecture circuits seem to be his only occupation. I think there should be some hidden agenda behind these charges. Mira Salganik: I think that the Musharraf case gives more food for thought on the universal questions of what happens to ousted dictators, and is there life after political death. Ekaterina Kudashkina: I take it that there is not much of a power base for Musharraf’s new party to contest elections in Pakistan, but still none of the big political players in the country are keen to see Musharraf back home. Is this why we have this court warrant, with the accusations of his complicity in Bhutto’s murder? Did he really have a hand in her assassination? Mira Salganik: Many watchers of Pakistan’s political life believe that Benazir Bhutto’s return to Pakistan was to a great extent negotiated by a White House disillusioned by Musharraf’s performance. There is no doubt that Musharraf agreed to her return and her participating in the 2008 elections. I see no reason why Musharraf would get involved in Benazir’s assassination – he had nothing to gain from it! In my mind, this is the only explanation for the court warrant and the rest of it. Sergei Strokan: Although Musharraf’s arrest abroad is not very likely, Pakistan’s Information Minister said the government will contact Interpol about seeking Musharraf's detention if the court requests it. Mira Salganik: I would like to return to the central issue. Musharraf has always denied any role in Bhutto's death and scoffed at critics who said he did not do enough to protect her. The Pakistani Taliban also denied targeting Bhutto. Musharraf may be accused of negligence of Benazir’s security arrangements, though I fail to see why the president of Pakistan should personally take care of it. I wonder whether these charges are an attempt by the Pakistani government—which as you know is facing numerous troubles—to turn public attention towards this sort of a manhunt? Particularly since Musharraf is much hated and that hunting him is presented as acting in accordance with the law of land he constantly violated. Ekaterina Kudashkina: I suggest we ask our expert. Today it is Javed Jabbar, a former senator and the minister of information and media development under Musharraf. What were the reasons for such a decision by the Pakistani authorities? Javed Jabbar: When referring to the Pakistani authorities, we have to distinguish between different layers and structures. I do not see this as a calculated decision at the highest level. This decision was made by an investigative arm of the Ministry of the Interior and there have been cases over the last few months that decisions made by the same agency were not endorsed by a superior institution. General Musharraf shares responsibility for, first of all, not providing adequate security for late Prime Minister Benazir Bhutto. Secondly, they think that it was his responsibility for ordering the cleanup of the assassination scene, where the bomb explosion and the shooting occurred. Thirdly, he ordered some officers to hold the press conference within 24 hours after the shooting in which the responsibility for the death was ascribed to an accident rather than assassination. So, on all the three grounds, the investigation team believes that he should also be charged. Ekaterina Kudashkina: Is this story widely covered in Pakistan now? Does it receive much attention from the public? Javed Jabbar: This decision by the investigative agency to summon him certainly got front-page attention and headlines in the online media, so to that extent it is well-known. But there are plenty of other things happening in the country which also take up public attention. There is the case of American diplomat Raymond Davis, who has been accused of killing two Pakistanis. This is the biggest issue in the country, along with other issues regarding the political process. Ekaterina Kudashkina: Is it right that Musharraf’s political carrier will end, whether or not he comes to the court hearings or is acquitted? As far as I know, he has not ruled out running for president in the next elections. Javed Jabbar: I would not make any definite statements about this being the end of his political career. He will continue participating in politics from outside Pakistan. There is no prospect in the immediate future of him returning to Pakistan because the situation does not allow him to move about freely. He is subject to being arrested or detained. Therefore, I don’t see any prospects for him coming back this time. However, the party that he has set up may continue actions on his behalf. But I do not see his physical presence in Pakistan in the near future.